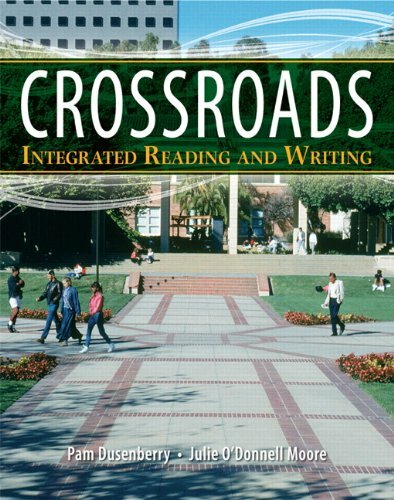 Crossroadsdemonstrates how reading and writing are interrelated processes, weaving them together to prepare students for the critical reading, critical thinking, and expository writing expectations of college. Narrative Casebook: "What are the Most Important Purposes for Going to College?" Informational Casebook: "How Do We Navigate the Place of College?" Argument Casebook: "What Should Be Learned in College?" Why Do I Need To Know About The Academic Reading Process? What Is the Academic Writing Process? Casebook theme: What Is the Primary Purpose of a College Education ? What Is the Purpose of Narrative Support? Should I Make My Main Idea or Thesis Explicit or Implicit When I Use Narrative as Support? How Are Ideas Organized When Narrative Is Used to Support a Thesis or Main Idea? What Types of Language Do I Use When Using Narrative as Support? Are There any Special Terms I Need to Know in Order to Understand Narrative? Casebook Theme: How Do I Navigate the Place of College? What Is the Purpose of Using Information as Support? How Is Writing Organized That Uses Information as Support? What Types of Language Are Used with Information as Support? Casebook Theme: What Should You Learn During Your College Education? Are Main Ideas and Thesis Statements Made Explicit in Argumentative Texts? How Are Ideas Organized When a Position is Argued? What Types of Language Do I Need to Be Aware Of? Are There any Special Terms I Need to Know About Argumentative Writing? From 'Social Class and Hidden Curriculum of Work'. Long in the Dark, Afghan Women Say to Read is Finally to See.